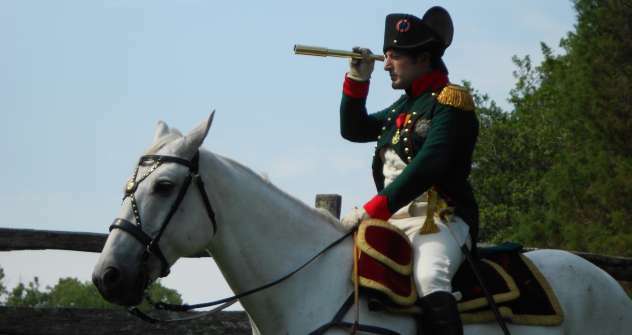 Mark Schneider appeared for the first time as Napoleon at Borodino reenactment in 2007. Source: Press Photo. Virginia’s Mark Schneider will portray the French Emperor at the bicentennial reenactment of the Battle of Borodino. On Sept. 2, Napoleon Bonaparte will mount his horse at the Battle of Borodino — just as he did 200 years earlier, when this field outside Moscow was the turning point of the French invasion of Russia. The Battle of Borodino took place on Sept. 7, 1812. The bloodiest day of the Napoleonic Wars, it involved 250,000 troops, over a quarter of whom would perish. Though Napoleon’s Grand Armée actually made some small advances, the battle proved to be the French campaign’s swan song: never again would Napoleon go on the offensive on Russian soil. For the bicentennial, the annual reenactment is expected to draw around 2,000 participants from Russia and abroad, as well as up to 200,000 spectators (including, rumor has it, Russian President Vladimir Putin). When he isn’t being Napoleon, Schneider is a historical interpreter at Colonial Williamsburg. He stands 5’6,’’ just like the Emperor. He shares the same deep-set eyes, prominent nose and compact build. He even speaks the same Corsican-accented French. He became interested in Napoleon as a child, thanks in part to his French mother. After he served in the military, his friend Ron Roberts asked him to join his French cavalry reenactment unit, the Seventh Hussars. Observing that Schneider “looked kinda like Napoleon,” Roberts suggested he try playing him. “The next thing I knew, I was Napoleon,” he said. Schneider has since played Napoleon at countless historical reenactments and official events. He has also appeared in History Channel specials, including “Was Napoleon Murdered?” (Schneider’s verdict: no; he died of stomach cancer). Schneider became involved with Borodino through organizer Alexander Valkovich, who played Tsar Alexander I to his Napoleon at a reenactment in Austria. “He’s remarkably similar to the great general, from Napoleon’s distinctive abrupt gestures and powerful stride to his manner of riding,” Valkovich said. “Just like the Emperor, he immediately sets the horse to a gallop.” “He really, really looks like him,” said Alexei Roshchin, another organizer. At Borodino, however, Napoleon was not in his prime: he’d put on weight, and had lost some of his former vigor. “All that needs to be reflected,” Schneider said. On the day of the reenactment, Schneider will participate in a round of official ceremonies and proclamations before stepping aside for the battle itself, a tightly choreographed event requiring several days of rehearsal. But the real highlight will be seeing friends from the reenactment circuit, whom he communicates with in French and English. “We’re really all part of a smaller community of enthusiasts of the Napoleonic period,” he said.